Desirable early map showing Texas. Le Nouveau Mexique avec la partie Septentrionale de L'anciene ou de La Nouvelle Espagne. 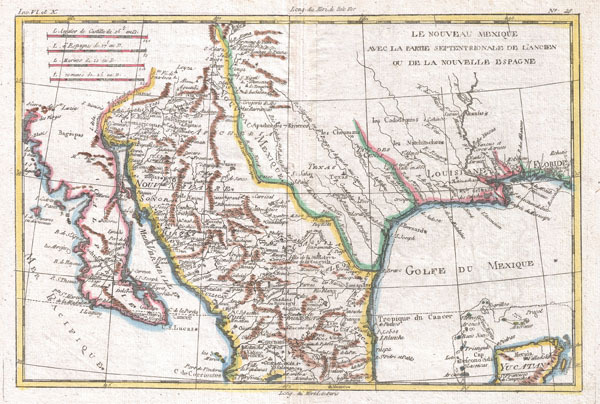 This is a beautiful c. 1780 Bonne map of northern Mexico and Texas. Covers from the Pacific Ocean through Mexico, Texas and Louisiana to western Florida, extends north as far as the Mission of St. Jeronimo de Taos (just north of Santa Fe) and south as far as Guadalajara and the northern Yucatan. More specifically, this map includes the modern day regions of Baja California, northern Mexico and the states of Arizona, New Mexico, Texas and Louisiana. Depicts the region in considerable detail expecially in regard to place names, Indian villages, missions, and riverways. In the Texas region there appears a city of 'Texas,' presumably the old Mission de Los Tejas from which name 'Texas' is derived. Just to the east of this city there is a notation regarding the 1665 death of the explorer La Salle. In present-day Arizona, the Gila River is referenced as the 'Rio de los Apostolos.' This map is heavily based on the work of D'Anville and was issued for G. Raynal's Atlas de Toutes les Parties Connues du Globe Terrestre, Dressé pour l'Histoire Philosophique et Politique des Établissemens et du Commerce des Européens dans les Deux Indes. Lowery, Woodbury, The Lowery Collection: A Descriptive List of Maps of the Spanish Possessions within the Present Limits of the United States, 1502- 1820, 545. Phillips (Atlases) 652-28. Wheat, C., The Mapping of the Transmississippi West, 1540-1861, #187.